For fans of all things melodic heavy/power metal, four years is too long too wait for an new album from Brazilian greats Angra. Easily spoken in the same breath as Helloween, Gamma Ray, Stratovarious, (early) Edguy and many others, Angra retains their strength and carries the flag of this oft chastised and too often (poorly) mimicked genre. 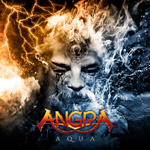 Their seventh album, Aqua is pure Angra and pure melodic power metal, with some stylish prog nuances. Inspired from Shakespeare's The Tempest, Aqua reflects the sea tale. Passing over the intro, Aqua delivers a sonic assault with the pure melodic power metal of Arising Thunder. As typical as this piece my seem, it merely proves that the genre is vibrant and Angra masters it. Later, Rage of the Waters reinforces this perspective, but this piece brings in Angra's affection for a more progressive sound. And this is where Angra shines the brightest. Hollow, Spirit of the Air, and the absolutely brilliant Lease of Life are dynamic compositions of musical power and intrigue. Strong song composition is empowered by some of the strongest musicianship from Angra on any album. With just a mention of these few brief examples, Aqua is singular piece of pure Angra brilliance. I'm not sure if still want to wait another four years for another Angra LP, but with breadth and depth of Aqua I just might. Until then I'm just going to dig this album. Fans of Angra, and great melodic heavy metal, do not pass Aqua by. Strongly recommended! Fans of Angra, and great melodic heavy metal, do not pass Aqua by. Strongly recommended!